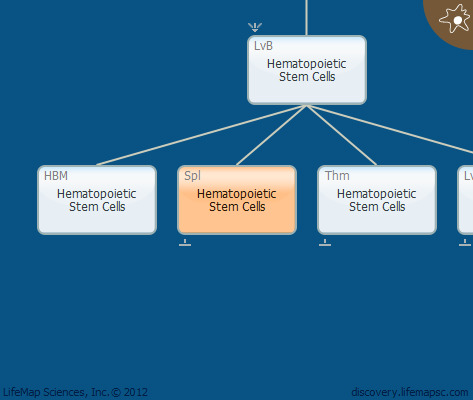 Hematopoietic stem cells (HSCs) are multipotent, myelolymphoid stem cells which serve as a source of hematopoietic cells. During embryogenesis , the spleen sustains hematopoietic capacity and HSCs circulating in the embryo colonize the spleen.The fate of the HSC progeny in the fetal splenic environment is myeloid. Although there are differences in hematopoiesis between the fetal liver and fetal spleen, there are virtually no phenotypic, functional, or gene expression differences between the HSCs in these organs. Hematopoietic stem cells migrate from the fetal liver to the spleen at E13. These cells do not expand significantly in the fetal spleen. These precursor cells are lineage-negative (Lin-), namely, they lack detectable surface markers specific to the T, B, macrophage, granulocytic, and erythroid lineages.